Objective To compare β lactam monotherapy with β lactam-aminoglycoside combination therapy for severe infections. Data sources Medline, Embase, Lilacs, Cochrane Library, and conference proceedings, to 2003; references of included studies; contact with all authors. No restrictions, such as language, year of publication, or publication status. Study selection All randomised trials of β lactam monotherapy compared with β lactam-aminoglycoside combination therapy for patients without neutropenia who fulfilled criteria for sepsis. Data selection Two reviewers independently applied selection criteria, performed quality assessment, and extracted the data. The primary outcome assessed was all cause fatality by intention to treat. 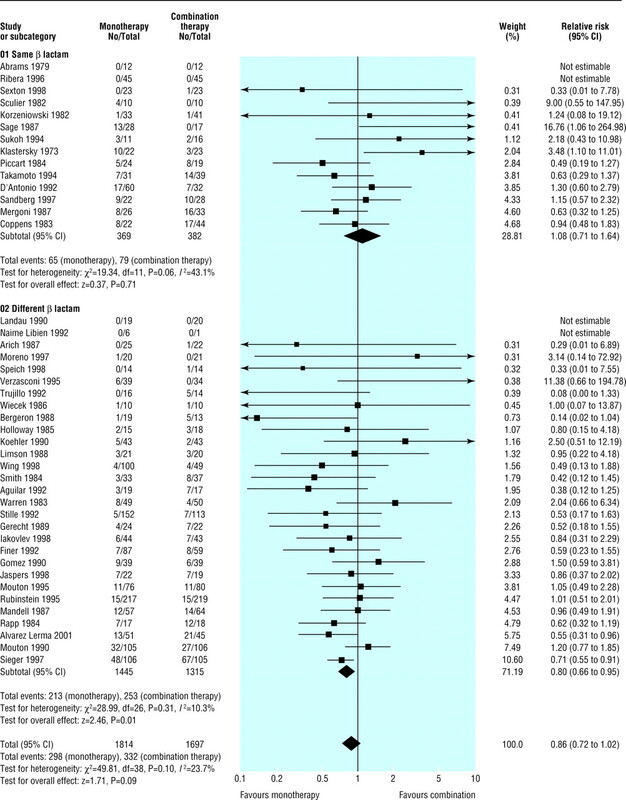 Relative risks were pooled with the random effect model (relative risk < 1 favours monotherapy). Results 64 trials with 7586 patients were included. There was no difference in all cause fatality (relative risk 0.90, 95% confidence interval 0.77 to 1.06). 12 studies compared the same β lactam (1.02, 0.76 to 1.38), and 31 studies compared different β lactams (0.85, 0.69 to 1.05). Clinical failure was more common with combination treatment overall (0.87, 0.78 to 0.97) and among studies comparing different β lactams (0.76, 0.68 to 0.86). There was no advantage to combination therapy among patients with Gram negative infections (1835 patients) or Pseudomonas aeruginosa infections (426 patients). There was no difference in the rate of development of resistance. Nephrotoxicity was significantly more common with combination therapy (0.36, 0.28 to 0.47). Heterogeneity was not significant for these comparisons. Conclusions In the treatment of sepsis the addition of an aminoglycoside to β lactams should be discouraged. Fatality remains unchanged, while the risk for adverse events is increased. Treatment with a combination of β lactam and an aminoglycoside is purported to be superior to β lactam monotherapy for sepsis on the basis of potential advantages such as in vitro synergism and prevention of development of resistance.1–7 Textbooks and guidelines advise the combination for specific pathogens, such as Pseudomonas aeruginosa and other Gram negative bacteria, and for infections commonly caused by these pathogens.8 9 In aiming for optimal antibiotic treatment of severe infections, hospital clinicians tend to use combination therapy despite the lack of direct evidence for its effectiveness. Observational studies show that 25-30% of patients with bacteraemia,10 11 surgical infections,12 or pneumonia,13 14 50% of those with klebsiella bacteraemia,15 and 56% of patients with septic shock in the intensive care unit16 are given β lactam-aminoglycoside combination therapy. We performed a systematic review and meta-analysis of randomised trials comparing β lactam-aminoglycoside combination therapy with β lactam monotherapy for severe infections in patients without neutropenia. We searched Medline, Embase, Lilacs, the Cochrane Library (all up to March 2003), conference proceedings of the Interscience Conference on Antimicrobial Agents and Chemotherapy (1995-2002), and citations of included trials with the terms: (aminoglycoside* OR specific aminoglycosides) AND ((infect* OR sepsis OR bacter* OR septicemia OR specific infections/pathogens) OR combi*)). We included studies regardless of date, language, or publication status, and we contacted authors for complementary information. We included all randomised and quasi-randomised trials that compared any β lactam monotherapy with any combination of a β lactam and an aminoglycoside for severe infections. Severe infection was defined as clinical evidence of infection, plus evidence of a systemic response to infection.17 We excluded studies with a dropout rate above 30%, unless intention to treat analysis was given for mortality or failure outcomes, and studies with more than 15% of patients with neutropenia, neonates, and preterm babies. The primary outcome assessed was all cause fatality by the end of study follow up and up to 30 days. Secondary outcomes included treatment failure, defined as death, non-resolving primary infection, any modification to allocated antibiotics, or any therapeutic invasive intervention not defined by protocol; bacteriological failure, defined as persistence of primary pathogen; bacterial and fungal superinfections and colonisation; adverse events; and length of hospital stay. We separated studies that compared the same β lactam from studies that compared different β lactams. We performed subgroup analyses for P aeruginosa infections, any Gram negative infection, bacteraemia, and specific sources of infection. Two reviewers independently applied inclusion and exclusion criteria and extracted the data. We extracted outcomes by intention to treat, unless the reasons for exclusions were not presented. In this case, we used the presented results (per protocol analysis) in the main analysis and compared them with results using all randomised patients and assuming failure for drop outs. Heterogeneity was assessed with a χ2 test and the I2 measure.18 We expected heterogeneity with respect to outcomes and used the random effects model, comparing it to a fixed effect model.19 We calculated relative risks with 95% confidence intervals and numbers needed to treat. Study quality measures extracted were allocation generation and concealment, blinding, intention to treat or per protocol analysis, designation of drop outs to treatment arms, number of drop outs, follow up and outcome predefinitions, and publication status.20 The effect of these measures was examined through sensitivity analysis. We examined a funnel plot of the log of the relative risk against the weight to estimate potential selection bias (such as publication bias) and to assess whether effect estimates were associated with study size. We evaluated 144 eligible randomised trials and included 64 in the review (fig 1). The trials included 7586 patients, nearly all adults, and were performed between the years 1968-2001. The median number of patients per trial was 87 (range 20-580). Trials differed by the population targeted, type of infection, and antibiotics compared (table 1). The major conditions were severe sepsis, pneumonia, or Gram negative infections (41 trials), abdominal infections (11 trials), urinary tract infections (7 trials), and Gram positive infections (5 trials). Allocation to antibiotics was empirical in 56 trials. The same β lactam was compared in 20 trials, while all other trials compared one β lactam to a different, narrower spectrum β lactam combined with an aminoglycoside. All cause fatality—Forty three trials including 5527 patients reported all cause fatality. There was no significant difference between monotherapy and combination therapy when we combined these studies (relative risk 0.90, 95% confidence interval 0.77 to 1.06, fig 2). There was no difference among the 12 studies with 1381 patients that compared the same β lactam (1.02, 0.76 to 1.38) or among studies that compared different β lactams (0.85, 0.69 to 1.05). The heterogeneity for this comparison was low (I2 = 7.7%). Treatment failure—We compared clinical and bacteriological failures in 63 and 43 trials, respectively (figs 3 and 4). For both comparisons, monotherapy was not significantly different from combination therapy among studies that compared the same β lactam. Monotherapy was significantly superior to combination therapy among studies that compared different β lactams. The overall comparison favoured monotherapy for clinical failure (0.87, 0.78 to 0.97; 6616 patients; number needed to treat 34, 20 to 147) and for bacteriological failure (0.86, 0.72 to 1.02; 3511 patients). Subgroup analysis—Major effectiveness outcomes were compared within the defined patient subgroups expected to benefit most from combination therapy (tables 2 and 3). We did not detect an advantage to combination therapy with any subgroup tested. Mortality was higher among patients with P aeruginosa (21%), Gram negative infections (13%), and bacteraemia (15%), and outcomes were similar with combination versus monotherapy. Patients with infections outside the urinary tract (mainly pneumonia) had significantly fewer failures with monotherapy. 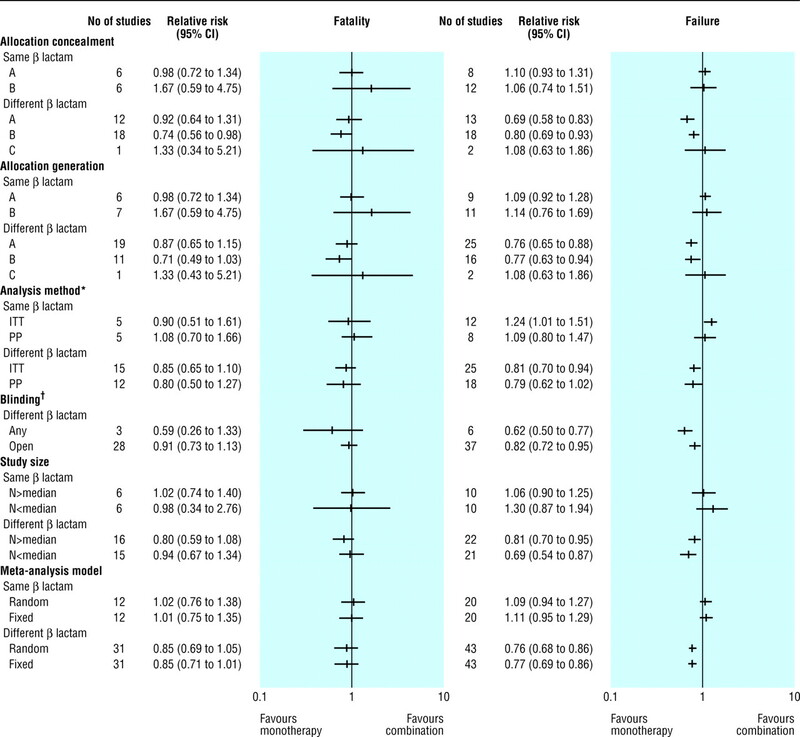 Five trials specifically assessed Gram positive infections, endocarditis in four (table 1).21 32 48 63 69 Combined relative risks for fatality and failure favoured monotherapy, although differences were non-significant. Development of resistance—Combination therapy did not lower bacterial superinfection or colonisation rates, which we would have expected if combination therapy prevented the development of resistance (fig 5). Relative risks tended in favour of monotherapy for bacterial superinfections (0.79, 0.59 to 1.06). Rates of fungal superinfection were similar. Six studies performed routine surveillance cultures, and nine assessed the development of resistance among pretreatment isolates. In these also we found no advantage with combination therapy. Twenty six studies reported coverage rates of the allocated treatment, although outcomes were not related to coverage. Among studies with different β lactams, the monotherapy β lactam provided broader coverage than the combination β lactam in 13 studies, the opposite occurring in two studies. Combined coverage of the β lactam and the aminoglycoside equalled monotherapy in these studies. Drop outs and adverse events—The dropout rate was 12.6% and similar in both study groups (1.01, 0.85 to 1.20, 24 studies, 3631 patients). Few patients (2%) discontinued treatment because of adverse events with no difference between study groups (0.89, 0.52 to 1.52, 15 studies, 3042 patient). Nephrotoxicity was more common with combination therapy in nearly all studies, and the combined relative risk was 0.36 (0.28 to 0.47, fig 6), corresponding to a number needed to harm of 15 (14 to 17) for combination therapy. In this systematic review of all randomised trials we have shown that β lactam-aminoglycoside combination therapy and β lactam monotherapy for the treatment of sepsis have similar effects in patients without neutropenia. Twenty trials compared the same β lactam. All cause fatality, the most significant and objective outcome, was not reduced by the addition of aminoglycosides. Clinical and bacteriological failure, which may be prone to bias with non-blinded trials and are of much lesser relevance to patients, were not significantly different. However, rates of adverse event increased with the aminoglycoside. Nephrotoxicity was much more common with combination therapy, while vestibular damage and ototoxicity, other important morbidities associated with aminoglycosides, were not routinely examined. Forty four trials compared a broad spectrum, usually novel, β lactam with a “routine” combination regimen. Rates of appropriate antibiotic treatment with combination therapy and monotherapy were similar when reported. Fatality was not significantly different. Failures were significantly more common with combination therapy. Among all trials, we found no evidence for any potential prevention of infection by resistant isolates with combination therapy. How should these findings be interpreted? It can be debated which design appropriately examines the clinical interpretation of synergism, studies comparing same or different β lactams. Synergism has been defined as a 2 log10 or greater reduction in bacterial count with the combination versus that with each of the agents alone.86 In studies comparing the same β lactam this is directly tested, but the effect of increasing the antibiotic spectrum cannot be separated from a synergistic effect. In studies comparing different β lactams the spectrum of coverage was similar in both arms. However, synergism can be examined only indirectly. If we assume that the aminoglycoside offers more than its additional coverage, the combination arm should perform as well, or better, than the broader spectrum β lactam monotherapy. With the former design we did not detect an advantage to the combination, while with the latter we found an advantage to monotherapy. The quality of included studies was poor overall. We did not detect bias induced by any of the measures assessed. We could not obtain data on all cause fatality for 33% of studies. 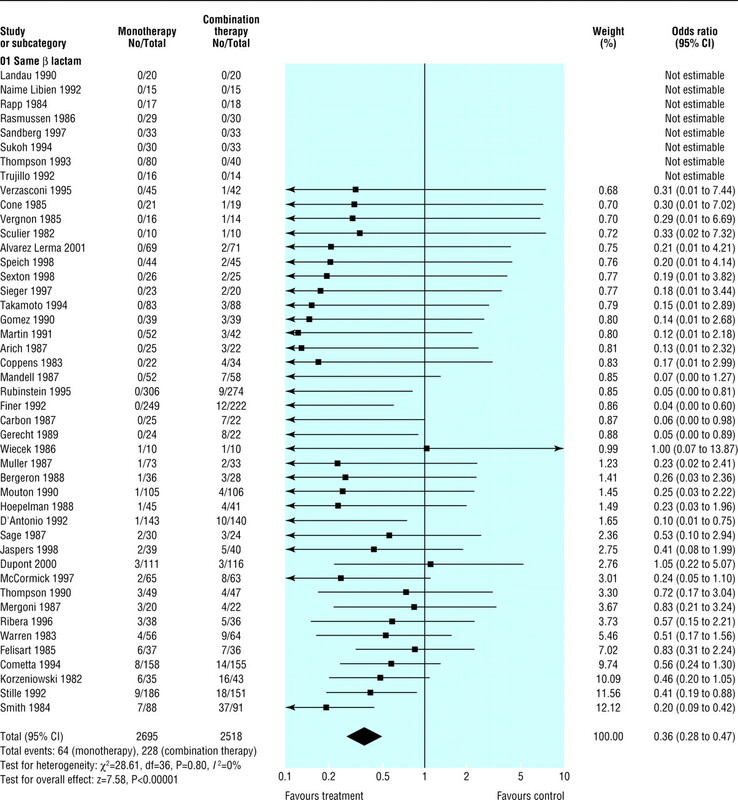 It is unlikely that missing results would shift the results for studies comparing the same β lactam (relative risk 1.02, 0.76 to 1.38), but it is of concern that studies comparing different β lactams (0.85, 0.69 to 1.05) may not detect important harm to patients. Our assessment of treatment effects for patients with P aeruginosa, Gram negative, and blood infections relies on subgroup analysis. We did not detect an advantage for combination therapy among these patients. Only few patients with documented P aeruginosa infections could be evaluated. The types of infections addressed by included studies—severe infections acquired in the hospital or pneumonia acquired in intensive care units—suggest that further infections were caused by this pathogen. Does further evidence support our findings? Immunocompromised patients are the most likely to gain from enhanced bactericidal activity possibly offered by β lactam-aminoglycoside combination therapy.9 In a comparison of β lactam monotherapy with β lactam-aminoglycoside combination therapy restricted to patients with neutropenia we found no advantage to combination treatment.89 Although the approach to the management of patients with and without neutropenia is separated in clinical practice, this similarity supports a biological basis underlying our results. Antibiotic treatment is nearly always instituted empirically and is often continued with no isolate to direct specific treatment. Most trials assessed this scenario and do not support a benefit for combination therapy. Clinicians may still opt for combination empirical treatment to increase the probability of appropriate empirical treatment, which has indeed been shown to improve survival.90 91 Current evidence suggests that aminoglycoside monotherapy may be inadequate for infections outside the urinary tract.10 92 93 Thus, for the purpose of enhancing antimicrobial spectrum, aminoglycosides may constitute a poor choice. Combination treatment is considered for patients with severe infections. However, these are the patients most prone to harm by the addition of an aminoglycoside. With no proved survival benefit, combination therapy may be unjustifiable. Several studies, included in the overall and subgroup analyses, directly assessed semiempirical combination versus monotherapy. These, similarly, do not support combination therapy for specific pathogens, when detected. Should further research be conducted to assess combination versus monotherapy? Novel β lactams should not be compared with older generation β lactams or penicillins combined with aminoglycosides. The reason for further trials assessing the addition of an aminglycoside to a β lactam seems dubious as well. The relative risks and confidence intervals available with all current evidence do not point to a potential benefit overall or in specific subgroups of patients. Furthermore, assessment of efficacy among subgroups such as patients with P aeruginosa infections probably requires an unachievable number of patients treated empirically at the time benefit of antibiotic treatment is most evident. We included in our review a small subset of trials that assessed the value of addition of an aminoglycoside in Gram positive infections. Three studies assessed staphylococcal endocarditis,21 48 63 one study assessed any staphylococcal infection,32 and one assessed streptococcal endocarditis.69 β lactam-aminoglycoside treatment is well ingrained in existing guidelines and clinical practice with these infections,94 yet our results do not point to a clinical benefit with combination therapy. With these infections, further studies should assess whether the addition of an aminoglycoside is justified. We thank the Cochrane Infectious Diseases Group for their support, review process, and help in obtaining papers; all the authors who responded for our requests for additional data; and Rika Fujiya, who translated the Japanese studies. The protocol for this review with the detailed search strategy and methods is published in the Cochrane Library.95 The complete review will be published in the forthcoming issue of the Cochrane Library. Contributors MP and LL performed the search. All authors selected trials for inclusion, performed data extraction and quality assessment of the trials, and analysed the data. MP and LL contacted authors and requested missing data. All authors participated drafting the manuscript for the Cochrane review and for the journal article. MP is guarantor for the article. Funding This work was supported by an EU 5th framework grant (TREAT project, grant No 1999-11459).
. Guidelines for the management of adults with community-acquired pneumonia. Diagnosis, assessment of severity, antimicrobial therapy, and prevention. Am J Respir Crit Care Med 2001; 163: 1730–54.
. Principles of anti-infective therapy. In: Mandell GL, Bennet JE, Dolin R eds. Mandell, Douglas, and Bennet's principles and practice of infectious diseases. 5th ed. Philadelphia: Churchill Livingstone, 2000.
. Monotherapy versus beta-lactam-aminoglycoside combination treatment for gram-negative bacteraemia: a prospective, observational study. Antimicrob Agents Chemother 1997; 41: 1127–33.
. Pseudomonas aeruginosa bacteraemia: an analysis of 123 episodes, with particular emphasis on the effect of antibiotic therapy. Int J Infect Dis 1998; 2: 211–5.
. Analysis of aminoglycosides in the treatment of gram-negative infections in surgical patients. Arch Surg 1999; 134: 1293–9.
. Diagnostic and therapeutic management of nosocomial pneumonia in surgical patients: results of the Eole study. Crit Care Med 2002; 30: 368–75.
. A nationwide survey of antibiotic prescribing patterns and clinical outcomes in patients with bacterial pneumonia. DICP 1990; 24: 1220–5.
. Prospective observational study of Klebsiella bacteraemia in 230 patients: outcome for antibiotic combinations versus monotherapy. Antimicrob Agents Chemother 1992; 36: 2639–44.
. Empirical antimicrobial therapy of septic shock patients: adequacy and impact on the outcome. Crit Care Med 2003; 31: 462–7.
. The ACCP-SCCM consensus conference on sepsis and organ failure. Chest 1992; 101: 1481–3.
. 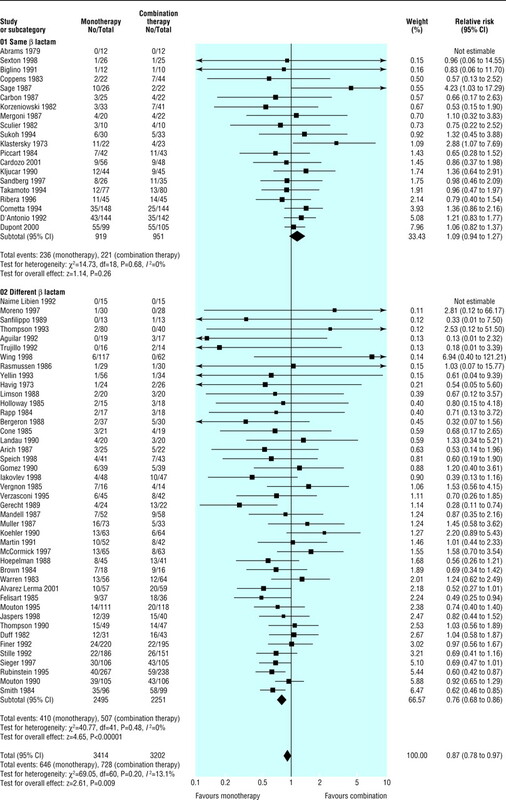 Measuring inconsistency in meta-analyses. BMJ 2003; 327: 557–60. eds. Cochrane reviewers' handbook 4.1.6. Oxford: Update Software, 2003.
. Single or combination therapy of staphylococcal endocarditis in intravenous drug abusers. Ann Intern Med 1979; 90: 789–91.
. [Clinical trial on efficacy and safety of ceftizoxime compared with penicillin-gentamicin of manafing of adult severe infections.] (In Spanish.) Compend Invest Clin Latinoam 1992; 12: 75–8.
. Efficacy of meropenem as monotherapy in the treatment of ventilator-associated pneumonia. J Chemother 2001; 13: 70–81.
. [Comparison of the efficacy of cefotaxime alone and the combination cefazolin-tobramycin in the treatment of enterobacterial septicemia.] (In French.) Pathol Biol (Paris) 1987; 35: 613–5.
. Cefoperazone compared with ampicillin plus tobramycin for severe biliary tract infections. Antimicrob Agents Chemother 1988; 32: 1231–6.
. Imipenem/cilastatin as empirical treatment of severe infections in compromised patients. J Chemother 1991; 3 suppl 1: 208–12.
. Moxalactam vs carbenicillin plus tobramycin: treatment of nosocomial gram-negative bacillary pneumonias in non-neutropenic patients. Curr Ther Res Clin Exp 1984; 36: 557–64.
. Cefotaxime (C) vs cefotaxime + amikacin (C + A) in the treatment of septicemia due to enterobacteria: a multicenter study. Chemioterapia 1987; 6(2 suppl): 367–8.
. [Evaluation of the association amoxicillin/sulbactam to a amoxicillin/sulbactam more gentamicins in childs with peritonitis of apendicular origin.] (In Spanish.) Pediatr (Asunción) 2001; 28: 15–9.
. Prospective randomized comparison of imipenem monotherapy with imipenem plus netilmicin for treatment of severe infections in nonneutropenic patients. Antimicrob Agents Chemother 1994; 38: 1309–13.
. Ceftazidime versus tobramycin-ticarcillin in the treatment of pneumonia and bacteremia. Antimicrob Agents Chemother 1985; 28: 33–6.
. Therapy of staphylococcal infections with cefamandole or vancomycin alone or with a combination of cefamandole and tobramycin. Antimicrob Agents Chemother 1983; 23: 36–41.
. Randomized comparison of ceftriaxone versus ceftriaxone plus amikacin for the empirical treatment of infections in patients with altered host defense: microbiological and clinical evaluation. Chemotherapy 1992; 38: 420–7.
. A comparative study of two antibiotic regimens for the treatment of operative site infections. Am J Obstet Gynecol 1982; 142: 996–1003.
. Monotherapy with a broad-spectrum beta-lactam is as effective as its combination with an aminoglycoside in treatment of severe generalized peritonitis: a multicenter randomized controlled trial. The Severe Generalized Peritonitis Study Group. Antimicrob Agents Chemother 2000; 44: 2028–33.
. Cefotaxime is more effective than is ampicillin-tobramycin in cirrhotics with severe infections. Hepatology 1985; 5: 457–62.
. Ceftazidime versus aminoglycoside and (ureido)penicillin combination in the empirical treatment of serious infection. J Royal Soc Med 1992; 85: 530–3.
. Prospective randomized comparison of mezlocillin therapy alone with combined ampicillin and gentamicin therapy for patients with cholangitis. Arch Intern Med 1989; 149: 1279–84.
. [Monotherapy (ceftazidime) versus combination therapy (cefradine + amikacin) in gram-negative bacteremia. A prospective, randomized study, 1987.] (In Spanish.) Rev Esp Quimioter 1990; 3: 35–40.
. Effect of ampicillin, chloramphenicol, and penicillin-streptomycin in acute cholecystitis. Scand J Gastroenterol 1973; 8: 55–8.
. Comparison of once daily ceftriaxone with gentamicin plus cefuroxime for treatment of serious bacterial infections. Lancet 1988; i: 1305–9.
. Treatment of infections in hospitalized patients with ticarcillin plus clavulanic acid. A comparative study. Am J Med 1985; 79: 168–71.
. [Multicenter open randomized trial of meropenem in comparison to ceftazidime and amikacin used in combination in severe hospital infections.] (In Russian.) Antibiot Khimioter 1998; 43: 15–23.
. Meropenem versus cefuroxime plus gentamicin for treatment of serious infections in elderly patients. Antimicrob Agents Chemother 1998; 42: 1233–8.
. Therapy with carbenicillin and gentamicin for patients with cancer and severe infections caused by gram-negative rods. Cancer 1973; 31: 331–6.
. Comparative clinical trial with ceftazidime (CAZ) versus ceftazidime plus tobramycin (TOB) versus azlocillin (AZL) plus tobramycin in ventilated patients with nosocomial lower respiratory tract infections (LRTI). Abstract 953. 30th Interscience Conference on Antimicrobial Agents and Chemotherapy; 1990; Atlanta, GA. American Society for Microbiology; 1990.
. Controlled clinical study of ceftazidime (3 × 1 g daily) versus piperacillin + tobramycin in patients with nosocomial pneumonia. Int J Exp Clin Chemother 1990; 3: 211–8.
. Combination antimicrobial therapy for Staphylococcus aureus endocarditis in patients addicted to parenteral drugs and in nonaddicts: a prospective study. Ann Intern Med 1982; 97: 496–503.
. [Ceftriaxone or combined cefazolin-gentamicin for complicated urinary tract infections.] (In Hebrew.) Harefuah 1990; 118: 152–3.
. Ceftazidime versus a combination of amikacin and ticarcillin in the treatment of severe infections. Clin Ther 1988; 10: 589–93.
. A prospective randomized trial of ceftazidime versus cefazolin/tobramycin in the treatment of hospitalized patients with pneumonia. J Antimicrob Chemother 1987; 20: 95–107.
. [Efficacy and costs of treatment with ceftriaxone compared to ampicillin-gentamycin in acute pyelonephritis.] (In French.) Rev Med Suisse Romande 1991; 111: 609–17.
. A prospective randomized trial of ceftazidime versus netilmicin plus mezlocillin in the empirical therapy of presumed sepsis in cirrhotic patients. Hepatology 1997; 25: 833–6.
. Azlocillin versus azlocillin plus amikacin in the treatment of severe infections in intensive care unit patients. Chemioterapia 1987; 6: 286–9.
. [Efficacy of several empirical antibacterial treatment regimens in renal transplant patients with fever.] (In Spanish.) Rev Espanol Quimioter 1997; 10: 138–45.
. [Prospective, randomized, controlled study of imipenem-cilastatin versus cefotaxime-amikacin in the treatment of lower respiratory tract infection and septicemia at intensive care units.] (In French). Presse Med 1990; 19: 607–12.
. Empirical monotherapy with meropenem in serious bacterial infections. Meropenem Study Group. J Antimicrob Chemother 1995; 36 sppl A: 145–56.
. , Doty JE, Mann LL, Manchester B. Antibiotics in infections of the biliary tract. Surg Gynecol Obstet 1987; 165: 285–92.
. [Clinical study to evaluate efficacy and safety of ceftizoxime compared vs penicillin-gentamicin fixed combination in the treatment of severe respiratory infections.] (In Spanish.) Compend Invest Clin Latinoam 1992; 12: 42–8.
. Single-drug versus combination empirical therapy for gram-negative bacillary infections in febrile cancer patients with and without granulocytopenia. Antimicrob Agents Chemother 1984; 26: 870–5.
. Ceftazidime versus tobramycin/ticarcillin in treating hospital acquired pneumonia and bacteremia. Pharmacotherapy 1984; 4: 211–5.
. Treatment of serious urological infections with cefotaxime compared to ampicillin plus netilmicin. Dan Med Bull 1986; 33: 49–51.
. Effectiveness of cloxacillin with and without gentamicin in short-term therapy for right-sided Staphylococcus aureus endocarditis. A randomized, controlled trial. Ann Intern Med 1996; 125: 969–74.
. Ceftazidime monotherapy vs. ceftriaxone/tobramycin for serious hospital-acquired gram-negative infections. Clin Infect Dis 1995; 20: 1217–28.
. A prospective randomised comparison of cefotaxime vs. netilmicin vs. cefotaxime plus netilmicin in the treatment of hospitalised patients with serious sepsis. Scand J Infect Dis 1987; 19: 331–7.
. Aminoglycosides do not improve the efficacy of cephalosporins for treatment of acute pyelonephritis in women. Scand J Infect Dis 1997; 29: 175–9.
. Mezlocillin versus penicillin and tobramycin in adolescent pelvic inflammatory disease: a prospective study. International Pediatrics 1989; 4: 53–6.
. Effectiveness of mezlocillin and endotracheally administered sisomicin with or without parenteral sisomicin in the treatment of Gram-negative bronchopneumonia. J Antimicrob Chemother 1982; 9: 63–8.
. Ceftriaxone once daily for four weeks compared with ceftriaxone plus gentamicin once daily for two weeks for treatment of endocarditis due to penicillin-susceptible streptococci. Endocarditis Treatment Consortium Group. Clin Infect Dis 1998; 27: 1470–4.
. Empiric treatment of hospital-acquired lower respiratory tract infections with meropenem or ceftazidime with tobramycin: a randomized study. Meropenem Lower Respiratory Infection Group. Crit Care Med 1997; 25: 1663–70.
. Cefotaxime compared with nafcillin plus tobramycin for serious bacterial infections. A randomized, double-blind trial. Ann Intern Med 1984; 101: 469–77.
. Efficacy, safety, and tolerance of piperacillin/tazobactam compared to co-amoxiclav plus an aminoglycoside in the treatment of severe pneumonia. Eur J Clin Microbiol Infect Dis 1998; 17: 313–7.
. Randomized multicenter clinical trial with imipenem/cilastatin versus cefotaxime/gentamicin in the treatment of patients with non-life-threatening infections. Eur J Clin Microbiol Infect Dis 1992; 11: 683–92.
. [Clinical evaluation of combination therapy of sulbactam/cefoperazone and aminoglycoside in respiratory tract infections.] (In Japanese.) Jpn J Antibiot 1994; 47: 170–80.
. Imipenem/cilastatin sodium alone or combined with amikacin sulfate in respiratory infections. [Japanese]. Jpn J Antibiot 1994; 47: 1131–44.
. Broad spectrum penicillin as an adequate therapy for acute cholangitis. Surg Gynecol Obstet 1990; 171: 275–82.
. Cefepime for infections of the biliary tract. Surg Gynecol Obstet 1993; 177(suppl): 30–40.
. [Research on efficacy and safety of ceftizoxime in treating lower respiratory tracta and skin and soft tissues infections.] (In Spanish.) Compend Invest Clin Latinoam 1992; 12: 31–41.
. [Comparative clinical trial of cefoperazone versus ampicillin + tobramycin in severe bronchopulmonary and pleural infectious pathology.] (In French.) Rev Pneumol Clin 1985; 41: 205–11.
. [Amoxicillin and clavulanic acid versus amoxicillin plus gentamicin in the empirical initial treatment of urinary tract infections in hospitalized patients.] (In German.) Schweiz Med Wochenschr 1995; 125: 1533–9.
. , Fitzpatrick B, DiFranco DE, Caplan ES, Tenney JH, et al. A randomized, controlled trial of cefoperazone vs. cefamandole-tobramycin in the treatment of putative, severe infections with gram-negative bacilli. Rev Infect Dis 1983; 5(suppl 1):173–80S.
. [Clinical evaluation of ceftazidime and the combined administration of cefotaxime and tobramycin in the treatment of urinary tract infections. 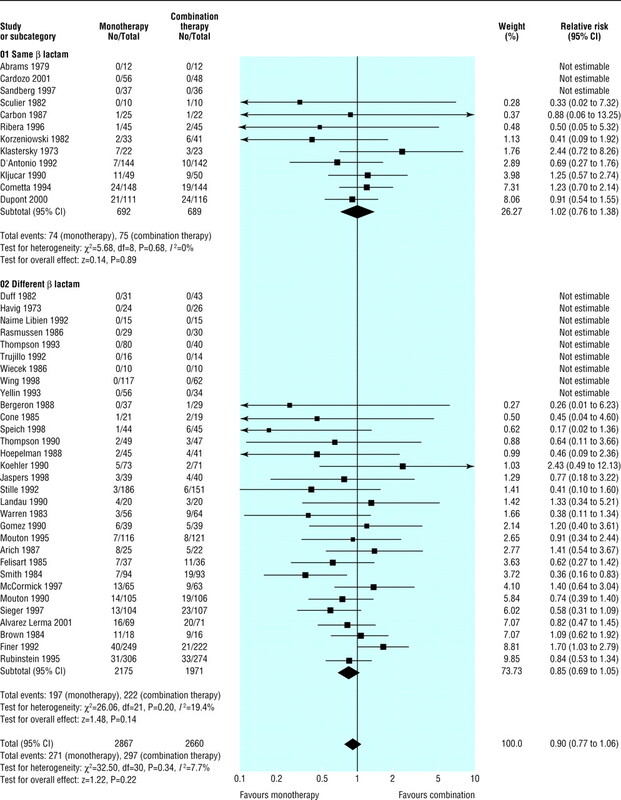 Prospective and randomized studies.] (In Polish.) Pol Tyg Lek 1986; 41: 1242–6.
. A randomized trial of three antibiotic regimens for the treatment of pyelonephritis in pregnancy. Obstet Gynecol 1998; 92: 249–53.
. A randomized study of cefepime versus the combination of gentamicin and mezlocillin as an adjunct to surgical treatment in patients with acute cholecystitis. Surg Gynecol Obstet 1993; 177(suppl): 23–40.
. Pharmacodynamics of antibacterial drugs. Infect Dis Clin North Am 2000; 14: 281–91, vii.
. Antibiotic therapy for Pseudomonas aeruginosa bacteraemia: outcome correlations in a prospective study of 200 patients. Am J Med 1989; 87: 540–6.
. Enterobacter bacteraemia: clinical features and emergence of antibiotic resistance during therapy. Ann Intern Med 1991; 115: 585–90.
. β lactam monotherapy versus β lactam-aminoglycoside combination therapy for fever with neutropenia: systematic review and meta-analysis. BMJ 2003; 326: 1111.
. Inadequate antimicrobial treatment of infections: a risk factor for hospital mortality among critically ill patients. Chest 1999; 115: 462–74.
. The benefit of appropriate empirical antibiotic treatment in patients with bloodstream infection. J Intern Med 1998; 244: 379–86.
. Aminoglycosides for intra-abdominal infection: equal to the challenge? Surgical Infections 2002; 3: 315–35.
. Diagnosis and management of infective endocarditis and its complications. Circulation 1998; 98: 2936–48.
. Beta lactam monotherapy versus beta lactam-aminoglycoside combination therapy for treating sepsis (protocol for Cochrane Review). Cochrane Library. Issue 2. Oxford: Update Software, 2003.